Bronchial hyper-responsiveness (BHR) is defined as increased airway sensitivity to various inhaled pharmacological agents (e.g., histamine or methacholine) and physiological stimuli (e.g., cold air or hypotonic salt) resulting in narrowing of the bronchi. A BHR test is considered to be positive when a provocative concentration of less than 8 mg/ml of histamine or methacholine (PC20) or a provocative dose (PD20) of less than 7.8 μmol of these bronchoconstrictive agents causes a ≥20% decrease from the baseline value of the forced expiratory volume in one second (FEV1) . There is an approximately 50% BHR prevalence rate in subjects with mild chronic obstructive pulmonary disease (COPD), and BHR is more prevalent in women than in men [2, 3]. COPD patients with airway hyper-responsiveness have an elevated risk of experiencing an accelerated decline in FEV1[4, 5]. Due to the structural changes and destruction that occur in the lung parenchyma in COPD patients, there is an increase in small airway resistance and a loss of lung elastic recoil, leading to a decline in the FEV1. It is assumed that these changes can lead to airflow obstruction [6, 7]; however, the FEV1 appears to be a poor predictor of these changes . Additionally, the correlation between FEV1 and dyspnea in COPD subjects is weak; a better correlation has been found between the forced inspiratory volume in one second (FIV1) and dyspnea . Nevertheless, using FEV1 to evaluate the response to a bronchial challenge is widely accepted . This acceptance is probably due to the simplicity of the measurement and its well-known reproducibility. Unlike FEV1 changes, the effects of inhaled histamine in COPD patients and the associated changes in inspiratory lung function parameters (ILPs) in stable, mild to moderate COPD patients are relatively unknown. Dynamic airway compression during forced expiratory maneuvers can mask the effects of intervention with bronchodilators (e.g., salbutamol) or bronchoconstrictors (e.g., histamine). Because dynamic compression does not occur during inspiratory maneuvers, we reasoned that there should be more observable change in the ILPs than in the FEV1 after administering the bronchoconstrictor histamine. Therefore, we hypothesized that the ILPs may be more sensitive to histamine bronchoconstriction than the FEV1 and may correlate more closely with dyspnea. The objectives of the present study included the following: to investigate the effects of inhaled histamine on the FIV1, inspiratory capacity (IC), forced inspiratory flow at 50% of the vital capacity (FIF50) and peak inspiratory flow (PIF), to study the changes in these inspiratory parameters at the time that the provocative dose produces a ≥20% decrease in the FEV1 and to investigate the correlation between the changes in these lung function parameters and the degree of dyspnea change, as measured by a visual analogue scale (VAS), when the bronchial challenge test is considered positive. Forty patients (including 12 women) with stable COPD were recruited from the outpatient clinic of the pulmonary department of the Canisius Wilhelmina Hospital in Nijmegen. The subjects had COPD that was classified as mild to moderate (at GOLD (Global Initiative for Chronic Obstructive Lung Disease) stage I or II based on postbronchodilator FEV1 values [11, 12]. The patients met the inclusion criteria if they had stable COPD, were between the ages of 40 and 80 years, were current or former smokers with at least a 10 pack-year history and did not demonstrate reversibility after using short-acting bronchodilators. Although reversibility can be defined as an increase in FEV1 that is both greater than 200 ml and 12% above the pre-bronchodilator FEV1 value, our patients were required to have historical records demonstrating less than 10% standardized reversibility (as a percentage of predicted FEV1) to short-acting bronchodilators [13, 14]. All of the included patients were in a stable disease state. Five patients were being treated with short-acting beta-2-agonists, 4 patients with short-acting anticholinergics, 24 patients with long-acting beta-2-agonists, 19 patients with long-acting anticholinergics, 16 patients with inhaled corticosteroids and 2 patients with oral theophylline. No patients were using oral corticosteroids. The patients visited the spirometry laboratory in the morning after having refrained from using inhaled corticosteroids for at least one week, from using short-acting inhaled bronchodilators for at least 6 hours, from using long-term beta-2-agonist bronchodilators for 12 hours and from using tiotropium or theophylline for at least 24 hours. No patients received antihistamines during the week prior to the study. The patients were defined as clinically stable if they had not had COPD exacerbations or changes in their COPD medications over the previous 8 weeks, had not used oral corticosteroids for a period of two months prior to the study and had not used antibiotics within the previous month. The exclusion criteria included an FEV1 < 50% of the predicted value, oxygen therapy, being unable to complete the questionnaires and the presence of allergic rhinitis, asthma, heart disease, neuromuscular disorders and any known form of pulmonary malignancy. The Medical Ethics Committee of Arnhem-Nijmegen in the Netherlands gave permission for this study, and all of the patients gave their written informed consent prior to study participation. The histamine inhalation tests were performed according to the ERS standards . The histamine solutions were stored at 4 degrees Celsius and were administered at room temperature. Six doses of histamine-acetyl-beta-methylcholine-chloride (0.04 mg, 0.09 mg, 0.18 mg, 0.29 mg, 0.71 mg and 1.30 mg, yielding a cumulative dose ranging from 0.04 to 2.60 mg) in normal saline were inhaled by tidal breathing for 1 min at 5-min intervals using a Koko DigiDoser dosimeter (PPS Research, Louisville, CO, USA). BHR was defined as a PD20 < 2.60 mg (8.48 μmol). The PD20 value is the provocative dose of inhaled histamine that produces a decrease of 20% or more in the FEV1. The baseline standard spirometry tests were performed first. Five FIV1 maneuvers were performed according to the procedures reported in our previous study, in which the subjects were asked to exhale slowly until reaching the residual volume level and to subsequently perform a forced, deep inspiration until reaching the total lung capacity (TLC) level . The best values for the FIV1, IC, FIF50 and PIF were obtained from these data. Subsequently, three FEV1 flow volume curves were obtained according to the ERS standards, and the best FEV1 was recorded. The IC was measured immediately before each forced inhalation using the method described by Hadcroft and Calverly . If the vital capacity (VC) was reached before the FIV1 during the inspiratory maneuvers, then it was assumed that FIV1 = VC. The largest FVC and FEV1 values were recorded. The reference values from the European Community for Steel and Coal were used for the predicted FEV1 and forced vital capacity (FVC) values . In the current study, the subjects who were exhausted and whose FIV1 and FEV1 values decreased by less than 10% from the baseline values were restricted to three forced inspiratory and three forced expiratory maneuvers. For the rest of the subjects, five forced inspiratory and three forced expiratory maneuvers were performed. After a pre-test with a saline aerosol solution, the challenges with sequential inhalations of the histamine aerosol began. A 1-min rest interval was provided between each dose of histamine. Afterwards, the above-mentioned standard lung function tests were performed. The challenge was terminated when there was an FEV1 decline of at least 20% or after the maximum histamine dose was administered. The patients with more than a 20% decrease in the FEV1 value after histamine administration were treated with four puffs of fenoterol 100 mcg/ipratropium 20 mcg to aid their recovery. For each patient, the PD20 value of the inhaled histamine was estimated by log-linear interpolation . We used the one-hour repeatability of these lung function parameters (the random variation expressed as the coefficients of repeatability (CR)) to compare the effects of the inhaled histamine on the ILPs and FEV1. The patients rated changes in dyspnea post-histamine administration using a VAS scale. The VAS scale is a 10-cm-long horizontal line that ranges from −5 to + 5 cm. VAS = −5 indicates significantly improved dyspnea, VAS = 0 indicates no change, and VAS = +5 indicates significantly worsened dyspnea. Prior to the test, all subjects were instructed on how to use the VAS scale. The one-sample t-test was used to compare the mean changes in lung function parameters from the baseline to the changes following different histamine dose steps. A repeated measures analysis of variance, ANOVA, was used to compare the mean changes in the various lung function parameters at the different dose steps. Pairwise comparisons of the lung function changes were made using the paired t-test. Spearman’s correlation coefficients (rS) were calculated. 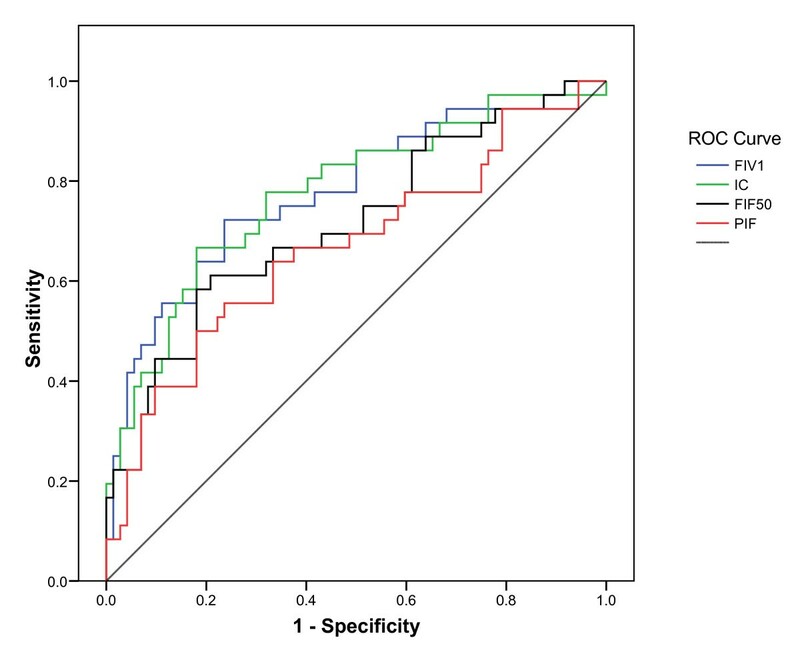 Receiver Operating Characteristic (ROC) curves was constructed to investigate the predictive value of the percentage change from baseline in the various ILPs in regard to reaching the PD20 endpoint. The areas under the curve (AUC) were calculated, and an AUC > 0.80 was considered to denote good predictive value. The analyses were performed using SPSS version 15.1 for Windows. A difference with a two-sided p-value < 0.05 was considered to be significant. Among the 39 included patients, we expected that at least 36 would reach the PD20 endpoint. With 36 patients, a correlation of 0.45 or greater between the FEV1 or ILP changes from baseline and the VAS could be detected at an alpha of 0.05 with a power of at least 80%. The baseline lung function values and patient characteristics are listed in Table 1. Only one of the forty subjects was excluded from the study. This subject developed persistent, severe dyspnea and had an FEV1 decrease of almost 19% after the first dose of histamine. One of the subjects stopped participating after the fourth dose; therefore, only seven patients participated up to dose step 5. Furthermore, two patients did not exhibit a significant response, despite being administered the highest dose. The effect of histamine on the various ILPs is shown in Table 2. Following the last administered dose of histamine, two of the four subjects did not display a positive provocation response. Figure 1 presents the mean changes from the baseline values observed at the various dose steps. All of the mean changes up to the sixth dose step were significantly less than zero, with the exception of the FIF50 at the fourth dose step. The ANOVA indicated significant differences between the various lung function changes at dose steps 1, 2 and 3 (all p < 0.006). 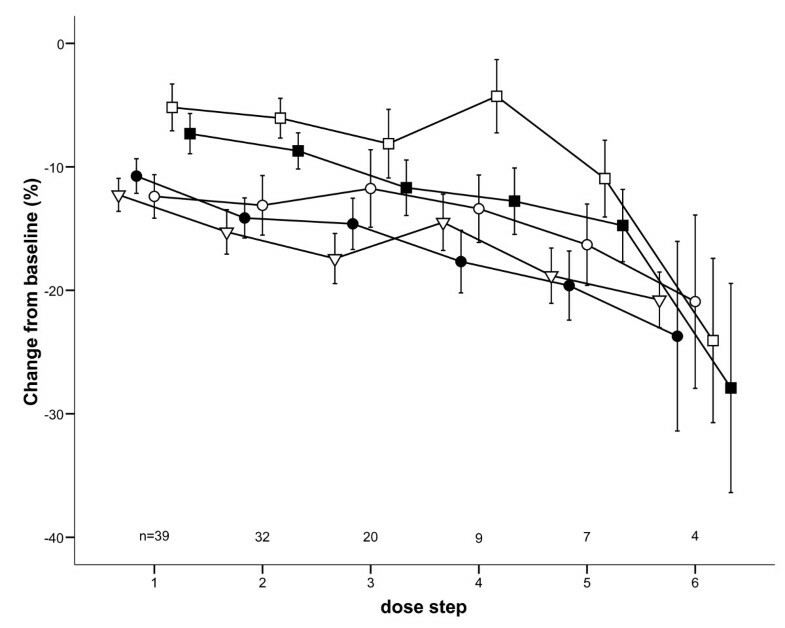 The FEV1 generally displayed the largest decrease at these dose steps, and the FIF50 displayed the smallest. At dose steps 1, 2 and 3, the mean FEV1 decrease was significantly greater than the corresponding FIF50 and PIF changes. No significant differences were found between the FEV1 changes and the changes in the FIV1 or IC. Possibly due to the small number of remaining patients, no significant differences were found among the measured parameters at dose steps 4, 5 or 6. N2 = number of subjects with a FEV1 decrease from baseline of ≥ 20% at the given histamine dose. The changes from the baseline values (± SEM) of the FIF 50 (open squares), PIF (solid squares), IC (open circles), FIV 1 (solid circles) and FEV 1 (triangles) after each dose of histamine;n = number of subjects tested at each histamine dose step. The PD20 endpoint was reached and the one-hour CR was investigated in 36 of the 39 patients. We defined a responder as a subject who demonstrated a change in a parameter value greater than the following CRs: 12% for FEV1, 14% for FIV1, 19% for IC, 21% for FIF50 and 18% for PIF . The results are summarized in Table 3. At PD20, more FEV1 responders were found than ILP responders. FIV1 and the IC were more sensitive than the flow parameters (FIF50 and PIF). To investigate which ILP was the best predictor of the occurrence of the PD20 endpoint, ROC curves were constructed for each ILP. Figure 2 demonstrates that the changes from the baseline FIV1 and IC values had the best predictive values (both AUCs were equal to 0.78). The predictive values of the FIF50 and PIF were somewhat lower, with AUCs of 0.71 and 0.67, respectively. The ROC curves for predicting the occurrence of an FEV 1 decrease ≥20% using the changes from the baseline values (%) of the FIV 1 , IC, FIF 50 and PIF. The areas under the curve are 0.78, 0.78, 0.71 and 0.66. The dotted line represents a test with no predictive value. The relationships between the percentage changes from the initial FEV1 values and the changes in the ILPs after the PD20 endpoint dose was reached are presented in Table 4. The mean percentage changes for all of the ILPs differed significantly from the corresponding changes in FEV1 (p < 0.04 for all parameters). In addition, all of the mean changes in the ILPs differed significantly from each other, with the exception of the changes in FIV1 versus the changes in IC (p = 0.75). Only the changes in FIV1 correlated significantly with the changes in FEV1. After reaching the PD20 endpoint, 8 of the 36 subjects had a decrease of more than 20% in their FIF50 and PIF values. The mean VAS score gradually increased with increasing histamine doses, indicating an increase in dyspnea from dose step 1 to dose step 5 (p < 0.001). No significant correlations were found between the changes in the lung function parameters and the VAS score at the dose where the FEV1 had fallen by 20% or more from the baseline (Table 5). The results of the present study demonstrate that the ILPs and FEV1 are sensitive to broncho-obstructive challenges. After each dose of histamine, there was a statistically significant decline in the FEV1 and ILPs, with the largest decrease being observed in the FEV1. The declines among the ILPs differed. The changes in the IC and FIV1 were larger than the FIF50 and PIF responses. Until now, no studies have examined the effects of histamine on the ILPs of subjects with mild to moderate forms of COPD. A greater number of FEV1 responders than ILP responders were found. Furthermore, the nadir was more pronounced in the FEV1 group than in the ILP group. Because the FEV1 changes were more sensitive to inhaled histamines compared to the ILP changes, we rejected our hypothesis that the ILPs might be more sensitive tools for detecting a bronchoconstrictive response than the FEV1. This finding may have been due to the small number of patients who participated in this study, but this result is consistent with a previous finding that FEV1 is a more sensitive parameter for detecting a bronchodilator response than the ILPs . Of all of the ILPs, only changes in FIV1 were found to have a significant (but moderate) correlation with the corresponding changes in FEV1 (rS = 0.47, p = 0.004) at the PD20 endpoint. Only 8 of the 36 subjects had a decrease of more than 20% in FIF50 and PIF. Additionally, the FIV1 and IC were more sensitive than the FIF50 and PIF. The FIV1 and IC changes from baseline again had the best predictive value for determining the patients who would reach the endpoint. There are currently no reports in the literature that support this finding. An overview of our PD20 endpoint data indicates that only two of the included subjects did not have a positive challenge test at the final dose. The majority of the population (30 subjects or approximately 77%) demonstrated a positive challenge test within the first three histamine doses. In a study by Kanner et al., the prevalence of BHR in subjects with mild COPD varied between 25-48%; furthermore, the prevalence of BHR was reported to be approximately 66% in mild or early COPD subjects in the Lung Health Study [21, 22]. However, a study by Taube et al. of nine subjects with stable, mild to severe COPD found a positive challenge test for all nine subjects after administering inhaled histamine . Asthma patients were excluded from our study. We made an active effort to exclude patients with diagnosed or possible undiagnosed asthma with well-defined inclusion and exclusion criteria. The high histamine sensitivity of our study population may have been due to several reasons. First, 13 subjects (33%) were current smokers, and 26 subjects (67%) were former smokers. In smokers with mild COPD, the presence of many mast cells in the COPD airways may lead to BHR . Second, some of these subjects had gastro-esophageal reflux, which can induce BHR . Third, some of the subjects had used inhaled corticosteroids (ICS). Withdrawal of ICS, which are known to reduce the maximal degree of airway narrowing, prior to entering the study may have led to an increased sensitivity to bronchoconstriction. While ICS have been proven to be important in reducing BHR in asthmatic subjects, they have not been found to be particularly effective in subjects with COPD . Jarad et al. suggested that even in subjects with COPD, the abrupt withdrawal of inhaled corticosteroids should be instituted carefully . No statistically significant correlations were found between the lung function parameters and the degree of dyspnea as measured by the VAS. These findings are inconsistent with those of Taube et al., who found a more significant correlation between the relative FIV1 changes (r = 0.730, p < 0.001) and VAS than between the FEV1 changes (r = 0.389, p < 0.01) and VAS after administering the bronchodilator salbutamol in patients with stable COPD . The finding that FEV1 and ILPs do not correlate with dyspnea is consistent with the results of our previously mentioned study of 85 stable COPD patients, in which we found no significant VAS changes after using short-term bronchodilators. Therefore, we also rejected our hypothesis that ILPs correlated more strongly with dyspnea following a histamine challenge. This difference may also have been due to the small number of patients who participated in our study and to our patient population having mild to moderate COPD rather than severe COPD, as in the study by Taube. Another possible explanation for the poor correlation between the FEV1 and VAS in our study is that most of the subjects had stable COPD for at least two months and were probably low perceivers . The most common lung function variables used to evaluate the degree of correlation with dyspnea in COPD subjects are the PEF and FEV1. There are no other available studies of the sensitivity of dyspnea scores in COPD subjects that have investigated the perception of dyspnea after administering inhaled histamine. We found that the FEV1 appeared to be more sensitive than the ILPs to increasing doses of inhaled histamine in subjects with stable, mild to moderate COPD. Although there was a decline in the FEV1 and in all of the ILPs, the largest decrease observed was in the FEV1. In vition, a greater number of responders were found when we focused on the FEV1 rather than on the ILPs. The FIF50 and the PIF appeared to be the least sensitive measures. Of the ILPs, the FIV1 and IC were the best predictors of which patients would reach the PD20 endpoint. No statistically significant correlations were found between the lung function parameters and the degree of dyspnea as measured by the VAS. We thank Glaxo Smith Kline who funded the data extraction. SKR managed the project and was responsible for the patients in the study. FV coordinated the study. BS carried out initial data. WH performed the statistical analysis.PRD and YH had the idea for the study.SKR, FV, PRD and YH all contributed to the writing of the paper. All authors read and approved the final manuscript.